Pricing “SaaS”: What’s the Right Price for Your Service? The Software-as-a-Service (SaaS) model is flourishing, expanding, and boldly going where it’s never gone before—how do you know the right price for your service? The pay-as-you-use model that is widely employed by SaaS offerings has even propagated into areas like manufacturing, where such “value-in-use” strategies are gaining wide acceptance. For companies trying to ensure that this model is as remunerative as it can be, a SaaS offering has to ensure a properly balanced pricing structure. Furthermore, which attributes of our offerings support the highest value needs from our prospects, and how can we look at historical data to inform this pricing model? I’d like to lead you through one approach that represents a model for adopting the appropriate pricing structure for your SaaS. It consists of a four-quadrant graph (pictured below) that represents the effect of commodization. By taking an inventory of the capabilities of your current products and services, and plotting these features on your quadrant graph, you can determine how to build out your Saas pricing structure. How popular is a given capability? First, determine the popularity of each and every capability of your product or service, i.e., how many customers need the capability. Track your usage of products, capabilities, features, and options, and determine which ones are most popular. Use this as an input variable for the horizontal axis. For instance, let’s say that your company sells smartphones. Dialing a phone number is pretty common and often used, right? It’s both a popular feature and it contains high volume frequency of use. You could place “phone dialing” pretty high on your capability popularity list (on the right side of the graph). View each of your capabilities through this lens, as a starting point in determining how many consumers are willing to pay or this feature. This was an important mechanism at Microsoft, as we knew how many people using Excel used pivot tables, or bolding of an item, or a certain function, for example. This helped us to decide what feature should go into what price level of the product. How unique is a given capability? Conversely, if you are looking at features like smartphone fingerprint recognition – that’s a pretty uncommon service on phones at this time. On your list of phone capabilities, this would likely rank very high in terms of uniqueness. Research on the uniqueness of a feature can be less than perfect, and rather subjective. A good start is to do a competitive analysis. How many of your competitors offer the same capability to their users? This data point drives the position on the vertical axis. Using the two criteria above, plot these data in the SaaS pricing chart above. Quadrant I – Entry level - Here’s where we plot products or services that are used by a plethora of consumers and are offered by competitors too—so you can’t ask a lot of money for them, if any at all. This is where “freemium” apps and services come into play, in addition to basic and cheap low-barrier-of-entry options. Quadrant II – Premium – Fingerprint recognition on a smartphone or tablet would fall into this category. Not every phone has fingerprint recognition, so it’s considered a premium capability. It has the high volume factor (it’s flashy and exciting, and many people can see themselves using it) and the uniqueness factor to render it a premium service. This would prompt a large group of customers to, for example, upgrade to a newer version, like from the iPhone 5 to the 5s. This also could be a premium product in a trial model, where you want people at some point to pay for something valuable. Quadrant III – Add-Ons—Here is where we think about value-added capabilities for your product or service. These are those very unique features that your product or service offers, but will not be needed by everyone. These are not considered to be a part of premium packages above, either; but rather, part of less-popular features that would need to be added onto packages or subscriptions. This could be a high-level security feature, for example, for which you could charge a premium price. 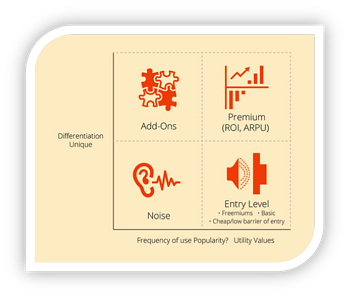 Quadrant IV – Noise—Unnecessary “noise” should be eliminated from your marketing if possible. This could, for example, be the voicemail function on a mobile phone. Even if the feature is on the product, if it’s not very unique and not many people perceive it anymore as an important capability, it’s not worth mentioning. If you detect noise in your product or service suite, you may even consider removing it completely. It’s important to take noise into consideration, because you may have it in places you didn’t consider before. Trim the fat and focus on the other three quadrants. Step 2: Use your data. Most SaaS technology companies have enough intelligence available in their hosting systems to show frequency of use and popularity. To determine how often people are using features, all you need to do is track how much, and how often, people click on certain capabilities in your software. You can do this through software like CrazyEgg or Qlikmaps, or Flurry Analytics for mobile apps, if you cannot track it inside your own app. How do you determine the uniqueness of the most desired features? That’s where your company needs to do homework. This is where you would test competitor software and products and gather user feedback. The “freemium” model works best if the product has a lot of value, but it’s not very unique. Maybe your competitor offers a similar service for free. Utilize freemium when you have a basic version that users can take advantage of for free forever, but with the intention that certain users will want capabilities that are only available in the upgraded, paid version. A “trial offering” is useful if the product is relatively differentiated, and you have a unique value proposition. For these services or products, ultimately, users will pay for even the most basic version. Let people start in the upper right hand corner and give them the most capable and unique product. Because you know that users won’t want to pull out their wallets until you deliver on your promise – a trial version is the best way to go for said service. Make sure the trial period is long enough so your user can use the product and experience the value in order to make a proper decision – but short enough to force the user to make a decision. No matter which model you choose, do take advantage of this period to onboard your customers and nurture them! If, during the trial process, they choose not to upgrade, move them back to the lower right hand service. You may also consider feature-based pricing, like that of Quickbooks. Depending on the consumer’s needs, Quickbooks provides several different software packages that fit every set of accounting and invoicing requirements, from an affordable, easy-to-use platform for the self-employed freelancer, to the sophisticated, multi-faceted financial command center for the corporate business. There will always be unique considerations for your particular market segment – but, ultimately, one notion tends to be constant: The right pricing for your SaaS organization lies somewhere within the adoption curve -- how long does it take for your consumer to experience its full capabilities, and come to rely upon it? Will they need upgrades or add-ons? Is there another product or service out there so similar to yours that they can access features you’ve marked as “upgraded” for free? 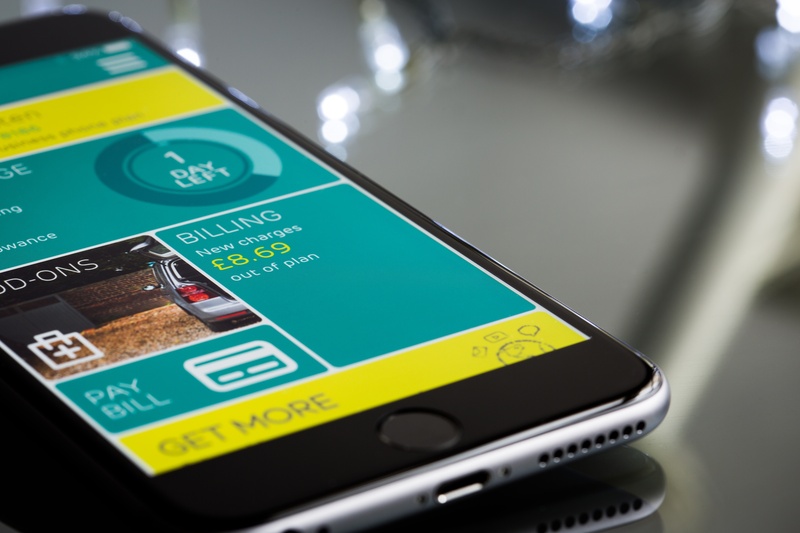 The utility factor, the uniqueness and popularity of your capabilities will ultimately be what will compel consumers to pay today – and tomorrow. By keeping the customer’s end goals in mind, keeping your competitors in sight, and working to design a model that does not leave any money on the table, you’re on your way to the ideal SaaS pricing structure for your organization.